Google Trusted Contacts Is One Of The Best App To Know Real-Time Location Of Your Family Members, Friends. It Works Better Than Google Maps’ Real-Time Location Sharing. Trusted Contacts Is Different From Google Maps‘ Real-Time Location Sharing. To Share Real-Time Location In Google Maps, Users Has To Share Link With Whom He/She Wants To Share Real-Time Location. While In Trusted Contacts App, You Have To Add Contacts On Whom You Trust You. Added Contact Can Request You To Share Real-Time Location. If You Failed To Respond, Then Your Real-Time Location Automatically Share With Trusted Contact. You Can Even Set Respond Time i.e. 5 Minutes. If Passes, Location Will Be Share Automatically. This Is Too Useful For Many Users Who Want To Track Their Family Members. While Google Maps Has A Limited Support For Sharing Location. The App Now Has Been Updated With Schedule Feature. 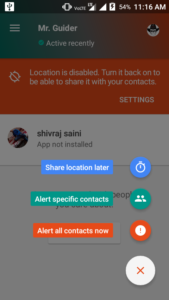 You Can Now Set Time Or Schedule Location Alerts To Trusted Contacts To Share Location On A Specific Time. Just Update The App, Tap On Floating Button. Click On Share Later. Add The Contacts, Set Time(Use +, – Buttons To Customize). That’s It. Your Location Alert For Trusted Contact Is Now Scheduled. If In Case, Your Phone Battery Is Dead Or Your Cell Signal Is Week Or Poor Or Not Before The Location Alerts Sent Then Your Last Location Will Be Send To Trusted Contact. This Is Too Helpful And Useful, If You Are Going Hiking Alone, Walking Home At Night, You Can Schedule A Location Alert To Be Sent At A Later Time. Unless Cancelled, The Selected Recipient Will Recieve An Alert With Your Last Known Location Even If Your Battery Is Dead, Or You Do Not Have Cell Signal.